It has been some time, but thanks to contributions from some fans out there, we’ve got a bunch of new content to add to the site throughout the year. First, we’ve added a new page called A Season to Celebrate. The page currently hosts a “One Goal Away”, a video tribute done by SportsChannel regarding the Whalers’ Adams Division Championship season. 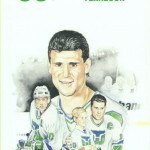 Also on that page is a great 25 minute audio piece about the Whalers’ championship season. Check them out! Two small audio clips have also been added. A copy of Brass Bonanza from NHL ’94 can be found on our Brass Bonanza page. The famous Whale clip from Mall Rats can now be found on our Ladies and Gentlemen… page. Enjoy! This entry was posted in Audio, Site News, Video. Bookmark the permalink.